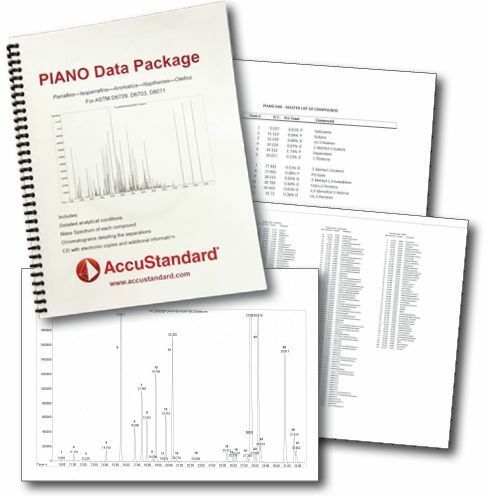 AccuStandard offers a petroleum naphtha-based PIANO mix (acronym for Paraffins, Isoparaffins, Aromatics, Naphthenes and Olefins). This mix is used to identify hydrocarbon components in spark-ignition engine fuels, including oxygenated blends of ethanol and tert-butyl methyl ether, with boiling ranges to 225°C in accordance with ASTM Methods D6729-04, D6730-01, and D8071-17. The data package provides the elution order and identities of the PIANO mix components. This information will be accurate and consistent for any gas chromatographic separation employing a methyl siloxane phase capillary column. Two hundred fourteen (214) individual hydrocarbons have been identified with a total of 263 compounds separated into the appropriate chemical class within the PIANO designation. These compounds comprise the master list. Each entry contains the Total Ion Chromatogram peak number, retention time, percent of the total and compound name. The master list is further categorized via extracted ion plots utilizing key ions for each chemical class. The retention time of each component in the extracted ion plot can be compared to the master list for identification. The analysis of the mix was performed on a 100 meter methyl siloxane phase capillary column with a 1.0 μm film (Quadrex Corporation, Bethany, CT.) in an attempt to improve low boiling range component separation. As in other published analyses, the complexity of the petroleum product resulted in a number of co-elutions and chromatographic peaks that cannot be identified with an acceptable degree of certainty. Consequently, the analysis and data are subject to the same disclaimers enumerated in ASTM Method D 6729-04 regarding the estimation of bulk hydrocarbon group-type composition. The chromatograms provided have been integrated to optimize the usefulness of the analysis and reduce the number of unidentified components present on the chromatogram. A PIANO booklet is shipped with each product and includes a CD with documentation in PDF format.